Measuring the size and concentration of particles in colloidal suspensions is a challenge, particularly for suspensions with particles smaller than 100 nm. 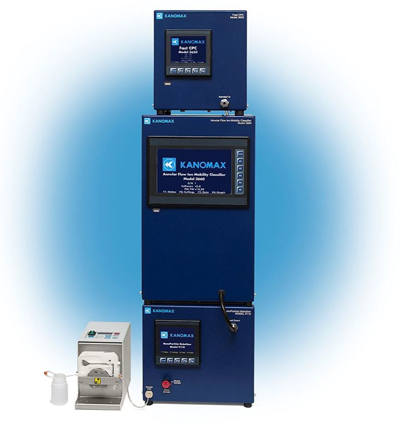 Kanomax FMT offers a solution that outperforms all other measurement methods — the Liquid NanoParticle Sizer system (LNS). The LNS provides outstanding size measurement capabilities in a small integrated instrument system. The LNS is an excellent choice for measuring particle size distributions in semiconductor Chemical Mechanical Planarization (CMP) slurries. The LNS is a fully integrated three-stage system incorporating a NanoParticle Nebulizer (NPN), an Annular Flow Ion Mobility Classifier (AFIMC) and a Fast Condensation Particle Counter (FastCPC) to measure particles as small as 5 nm. A sample of a liquid colloid suspension is introduced to the NPN through an online direct-feed method or using a peristaltic pump or autosampler. The sample can be diluted before introduction to reduce coagulation time and minimize contamination. The sample is nebulized and the largest droplets, which may contain multiple particles, are removed. The nebulized sample is heated to evaporate the water leaving an aerosol of particles suspended in the carrier gas. The aerosol particles are electrically charged using a safe and reliable soft x-ray charger. The AFIMC sorts the particles by size in an electric field and is capable of classifying particles from 5-6oo nm in size. Using varying electric field strength the AFIMC systematically selects particles of a narrow size band and passes them on to a FastCPC. The FastCPC immediately counts the concentration of particles in selected size bands and detects individual particles with a dynamic concentration range over three orders of magnitude. Unlike competing particle measurement technologies, the LNS provides actual, not relative, particle concentration. Combines proven techniques (used by NIST and AIST, Japan) for counting and sizing aerosol size distributions with a unique nebulizer technology to successfully measure particle size and number concentration in concentrated liquid suspensions. Offers greater accuracy, better precision, and improved resolution in CMP slurry size-measurement results (used extensively in the semiconductor industry). Straightforward data inversion without complex inversion routines, assumptions or size calibrations. The software can identify each particle-size mode and assigns a cumulative size at 10%, 50% and 90% of the distribution. Changes in the size of a specific mode can be easily monitored with these size statistics. Cited in two SEMI Guides. In SEMI C92 the LNS is used to determine the quality of ion exchange resin. In SEMI C79 the LNS evaluates the efficiency of sub-15 nanometer filters used in ultrapure water distribution systems. No other particle instrumentation is capable of making the required measurements described by SEMI C79.